‘Thyme is of the essence for new Whalesborough Cheese’ by James Fell in The Cheese and Deli Counter, Speciality Food Magazine (January 2018) -All about our new washed curd cheese featuring Lemon & Thyme Cornish Sea Salt! Our keen young team at Whalesborough Cheeses encouraged an older player (me) to trial some different Cornish Sea Salt blends to see how they would work with our recipes. We made, we waited and we tasted—and after some lively debate we all came to the same conclusion and Miss Thymed was born. We found our Miss Muffet – a washed curd cheese, was perfect for taking up the Lemon and Thyme Cornish Sea Salt’s delicate, herby, citrus flavours—being creamy, supple and not too acidic. The Lemon and Thyme blend of sea salt perfectly complements the savoury citrus cheese flavour with a lovely background of nuttiness from the natural mould rind. A real taste experience. Miss Thymed looks great on any cheese board with flecks of green thyme giving real texture and interest to the pate as well as tasting delicious. 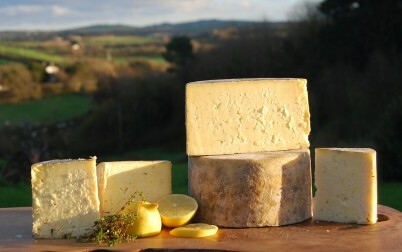 This new handmade Cornish cheese has terrific provenance using Cornish Sea Salt’s Lemon and Thyme blend and a broad appeal, being vegetarian rennet and pasteurised cows’ milk. We are happy to provide samples— don’t Miss out on Miss Thymed!